The SediMeter measures a vertical turbidity profile and calculates sedimentation and erosion with millimetre precision. The Lindorm SediMeter is a "sediment meter". It measures a 35 cm long vertical turbidity profile - using 36 optical backscatter detectors (OBS) - through the bottom, and calculates the level with micrometer resolution. The SediMeter is ideal for erosion and sedimentation measurements. The SediMeter can be used for detect when erosion happens, analyze siltation, and measure sedimentation rate, the latter both in terms of sediment accumulation rate, and in terms of sediment settling from suspension. It can be used to get real-time data on the dynamics of the sea floor, and it is ideal for monitoring sediment spill from dredging in real-time. The patented sedimeter sensor consists of an array of 36 infrared optical backscatter detectors. The turbidity is measured every 10 mm, and the bottom level is interpolated with a resolution of 0.001 mm. This may seem like an exaggeration, but it allows for the detection of change on a very minute scale, and thus of qualitatively correlating processes (waves, currents, dredging spill) to sediment accumulation and erosion on the bottom. It has been found that the sedimentation of as little as 100 g/m2 can be detected (see this video). There is also a dedicated 37th turbidity sensor mounted 11 cm higher up than the array of 36 OBSes. The calculated level, along with this turbidity, can be measured as "burst samples", up to 20 times for each measurement, at an interval of between 1 and 16 seconds. Thus the memory holds up to (20 x 16,384 =) 327,680 level and turbidity measurements. The turbidity data from the array of 36 OBSes is only saved once per measurement, though, and the same is true for temperature and battery data. 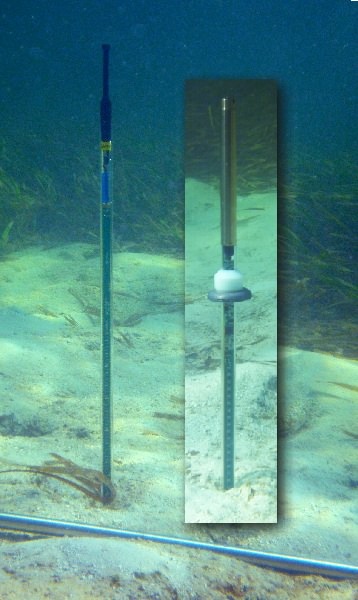 The SediMeter offers several deployment options. Both models, SM3A and SM3B, can be used either as a stand-alone logger, or connected to a cable, or both. The instruments support RS-485 at 9600 and 115,200 baud, and has a built-in rechargeable battery. The protocol supports daisy-chain networking, with hundreds of instruments along a single cable stretching over several kilometers. Radio telemetry can be used from a buoy to land, or via a satellite link. The required software is free. The SM3B is the first SediMeter with a built-in cleaner. This can enable it to operate for months on end, even in fouling environments. The SM3A offers the slimmest SediMeter ever, the entire instrument fitting inside the holder tube, including logger, battery, and under-water connector.